Shōdoshima, an island one hour by ferry from Takamatsu City in Kagawa Prefecture, had a midget submarine base in Uchinomi Town, which merged with another town to become Shōdoshima Town in March 2006. 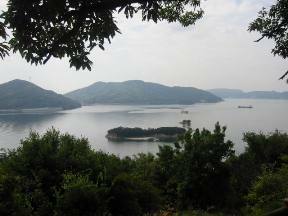 The Japanese Navy used the general term tokushu senkōtei (special submarines) for midget submarines, and Uchinomi Bay on Shōdoshima was the site of a Navy base for five-man Kōryū special submarines. During the height of the Greater East Asia War on May 2, 1945, the Navy established a special submarine base here at Uchinomi Bay. This unit's headquarters was put in Shōdoshima Junior High School. The men trained day and night to prepare for the impending final battle to defend the homeland. On July 22 of the same year, nine men under Lieutenant Commander Ikuma died in battle when hit by shells in an air attack on the surface of the sea near Sakate Bay. On August 2, squadron leader Lieutenant Junior Grade Horikawa and five other men died when they struck a mine in Harimanada Bay. On August 8, Lieutenant Junior Grade Yamanaka and another man died when hit by machine-gun fire while off Megamimaruya Island. However, the men at the base with spirits full of vigor somehow bore up well, and they waited until the time when they would rouse themselves to action. Suddenly the decree to end of the war was received, but somehow it seemed impossible to do this. Commander Ōtani gave comforting words to his chagrined officers and men who fought back tears. He dismissed the men at the base so that they would do their best to build a peaceful country as incomparable countrymen who now had ended their wartime duties. We erect this monument here with the desire to pass down forever to posterity the sweet fragrance of these war dead heroes. 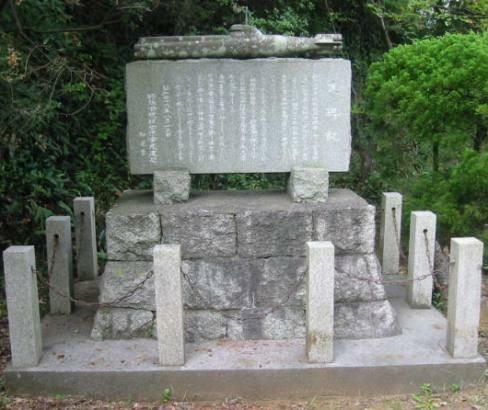 This monument honors Shōdoshima Special Attack Base war dead who gave their lives in 1945 during the late stages of the Pacific War. 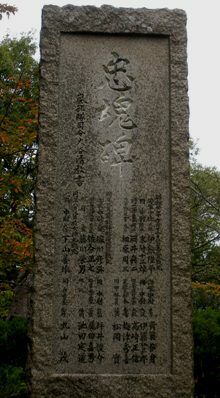 The monument was built in Furue, a place connected to the base. In the early spring of 1962, it was moved to the present location on Miyayama with the warm cooperation of Uchinomi Town authorities and the Uchinomi Hachiman Shrine chief priest. Memorial services for the war dead continued to be held by bereaved family members and persons related to the former base unit with the late Toramitsu Yoshioka playing a leading role. Recently these war dead have had the blessing of being remembered together with the spirits of the Uchinomi Shōkonsha (Shrine) at the regular ceremonies held there. At this place we bereaved family members and persons related to the former base unit express together our profound gratitude for the kindness of various individuals. We place here a carved model of a special submarine in which the war dead gave their lives so that it may tell future generations of their brave spirits. We pray that they may rest in peace forever.